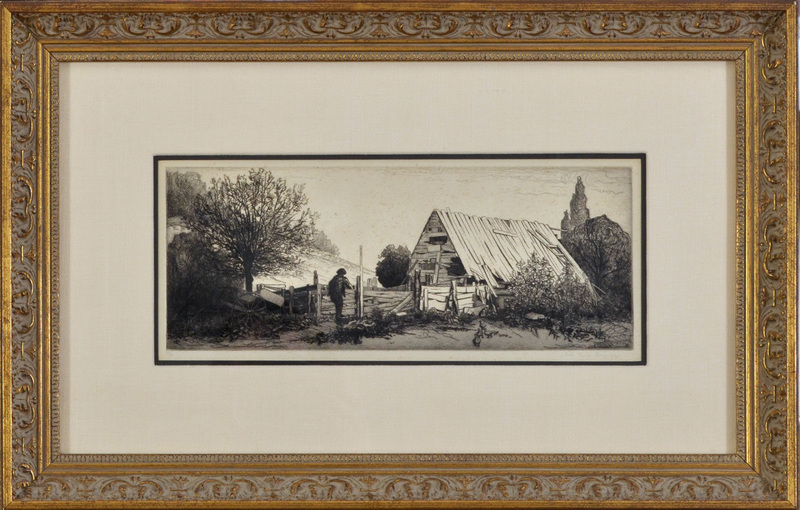 One of John Taylor Arms' early etchings, this image of a rural European farm measures 4 5/8 x 11 7/8 inches, pencil signed, dated and numbered 3/75, also titled "The Sty" and "La Parcherie". Printed by Frederick Reynolds, cat: Fletcher #83. 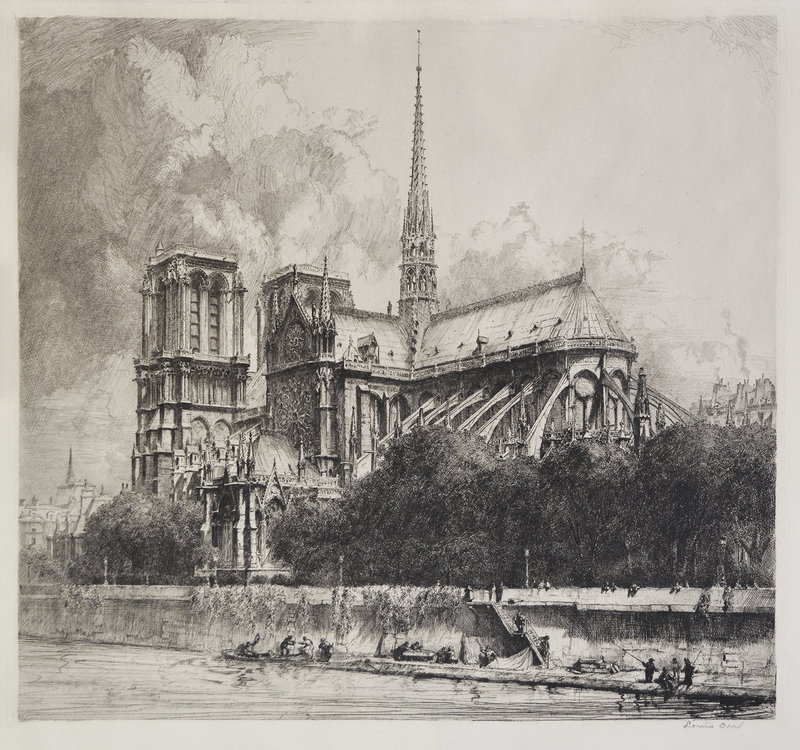 Created in 1920, this very detailed and expertly toned etching is beautifully matted and framed. This is an original pencil signed etching by American artist Joseph Pennell. 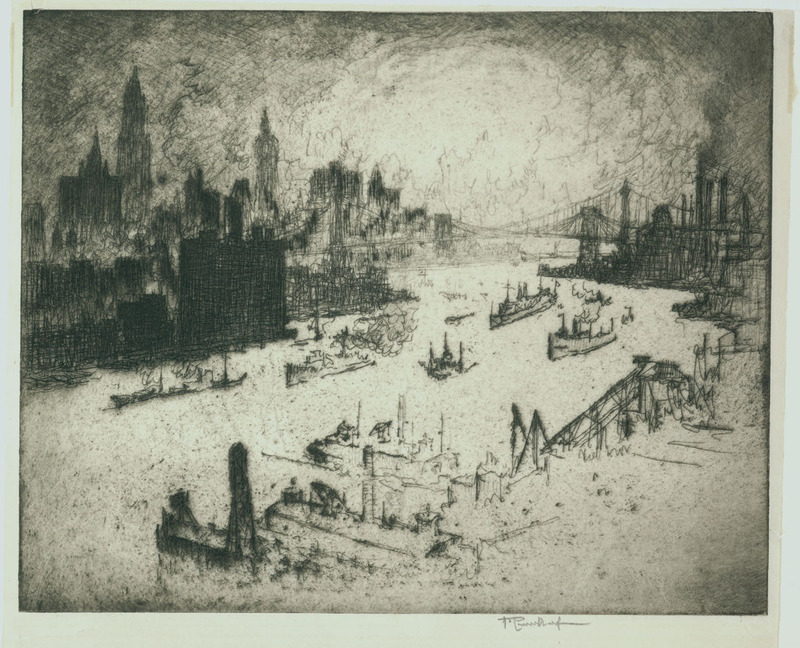 The title of this work is: "Sunset from the Williamsburg Bridge, NY" It was created and printed in 1915 in an edition of 100. The image measures 8 3/8X10 15/16 inches. It appears in the Wuerth catalog as image number 674. 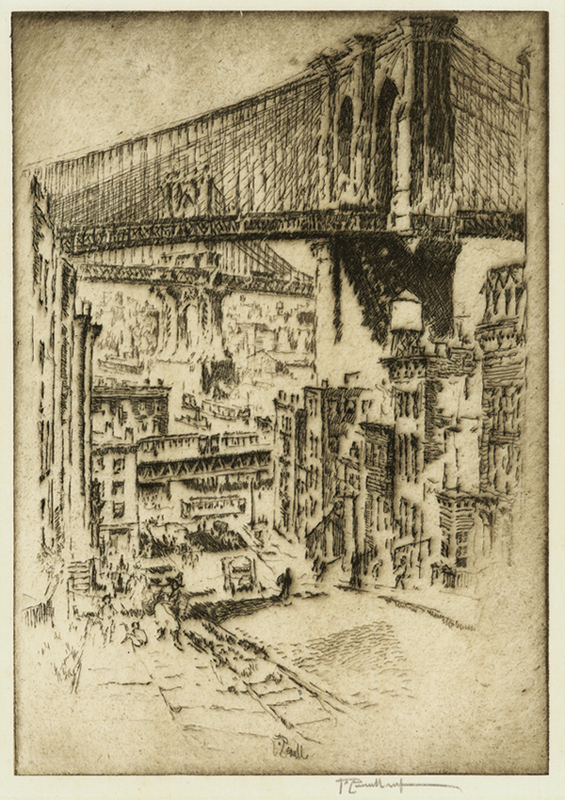 This etching has a collectors stamp in the lower border and the original Kappel N.Y. label. The margins are thin on three sides which was typical of Pennell's etchings. A fine and atmospheric image. 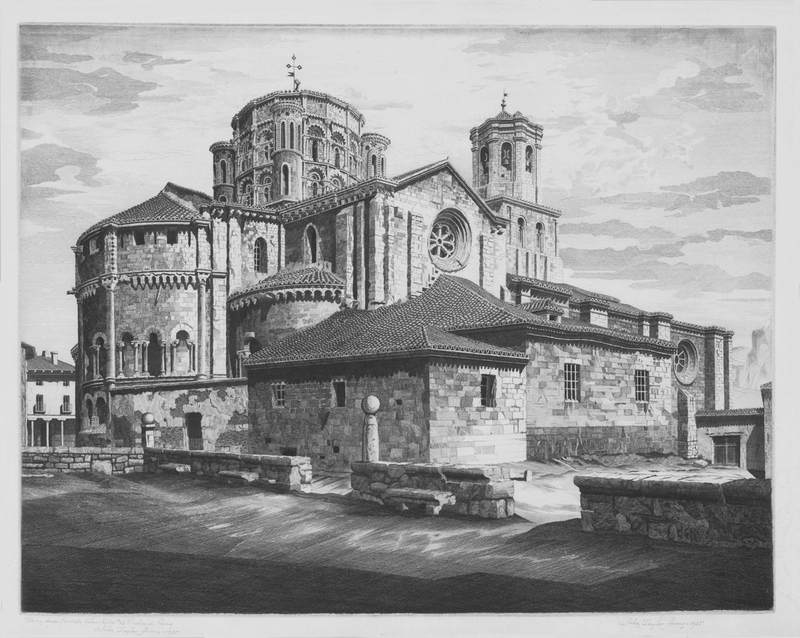 Etching, 1924, image size 6 1/4 X 11 1/4", edition of 150, printed by F.Reynolds, French Church Series, pencil signed. Also called "Byzantine Revsisited" and "The Cathedral of St. Pierre." 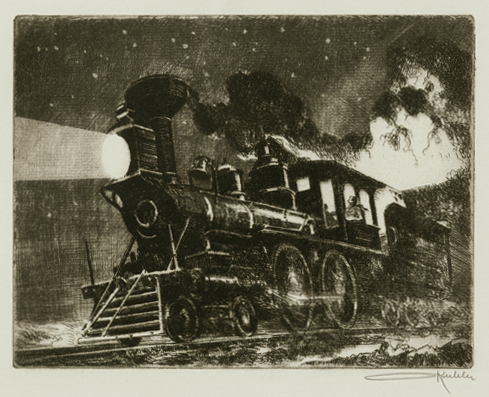 This is an evocative original etching by Kerr Eby, inspired by his experiences in Europe during WWI. 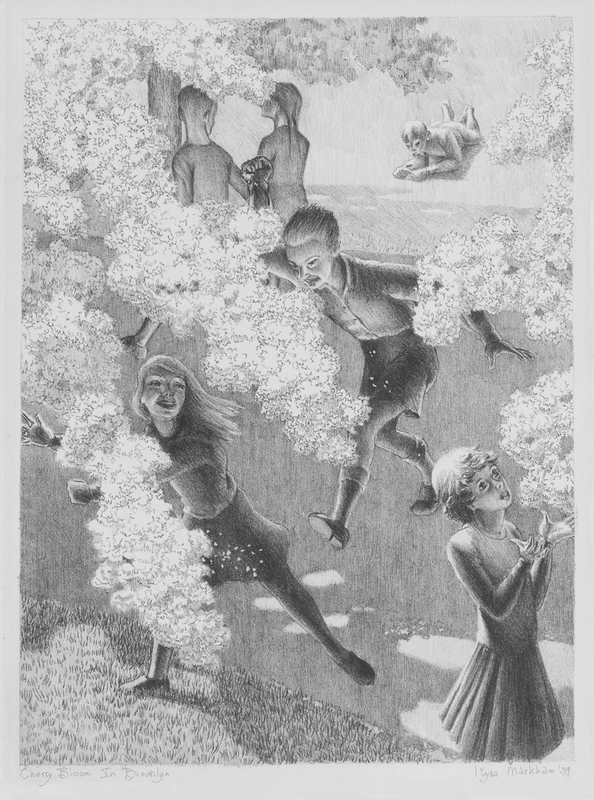 The image size is 4 7/8 x 13 3/8 inches, published in 1919 in an edition of 100, cat: Giardina-30, pencil signed "Kerr Eby imp", the "imp" indicating that Eby printed this impression himself. 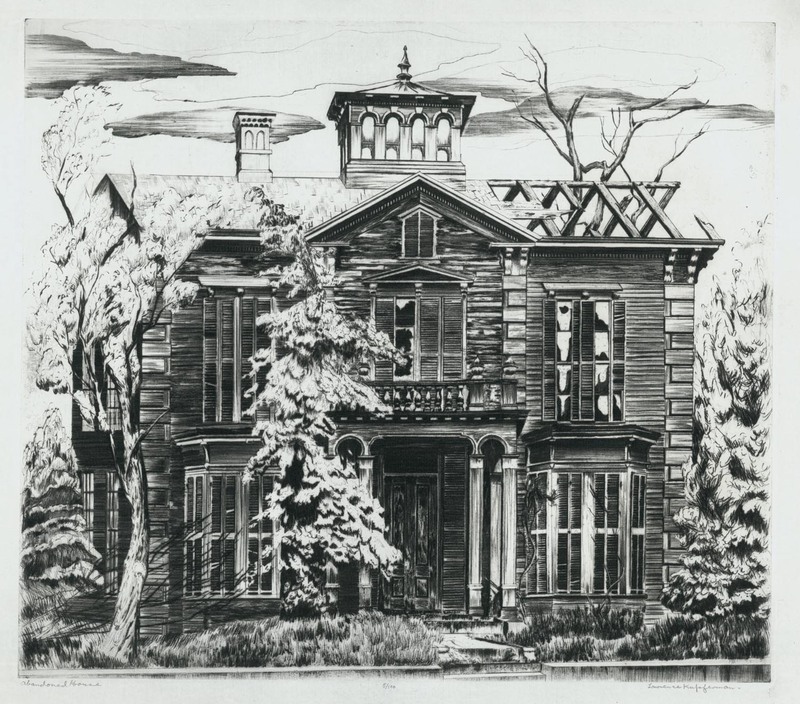 Kerr Eby was a remarkable printmaker and a member of the Cos Cob Art Colony and friends with many of the important artist of the day, including Childe Hassam and John Taylor Arms. Eby was known for his atmospheric renderings of the New England landscape as well as his dramatic images of WWI. 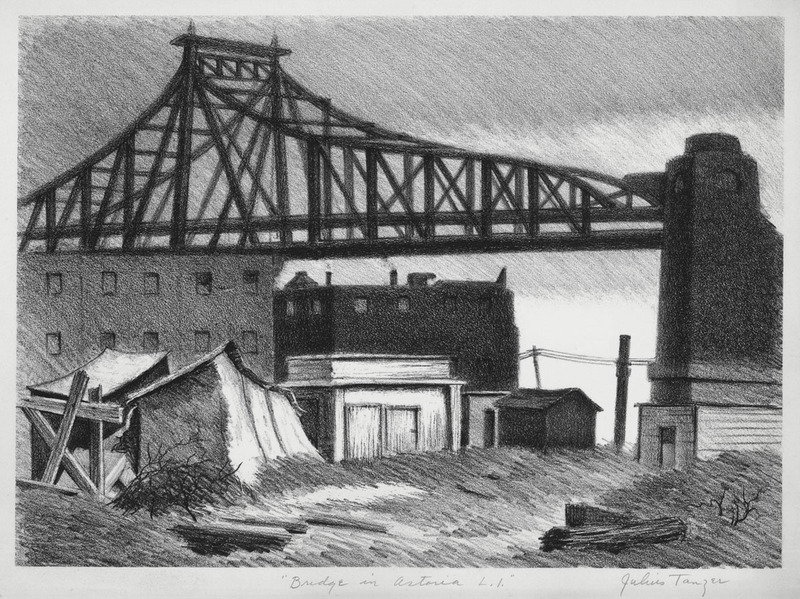 Etching, image size 9 7/8 x 6 7/8 inches, 1921, cat. Wuerth 782 and the cover, pencil signed. Wood engraving on maple from 1932. "C L imp" blindstamp in the lower left. "Trial proof" in pencil in the lower left. Only a few proofs were done in 1932. Printed in the 1970's by Letterio Calapai. Edition of 100. Catalog: Burne Jones 91. Plate measures 5 1/2 x 7 inches on 9 1/4 x 11 inch paper. A good impression of a bold and dramatic print with strong, even blacks. 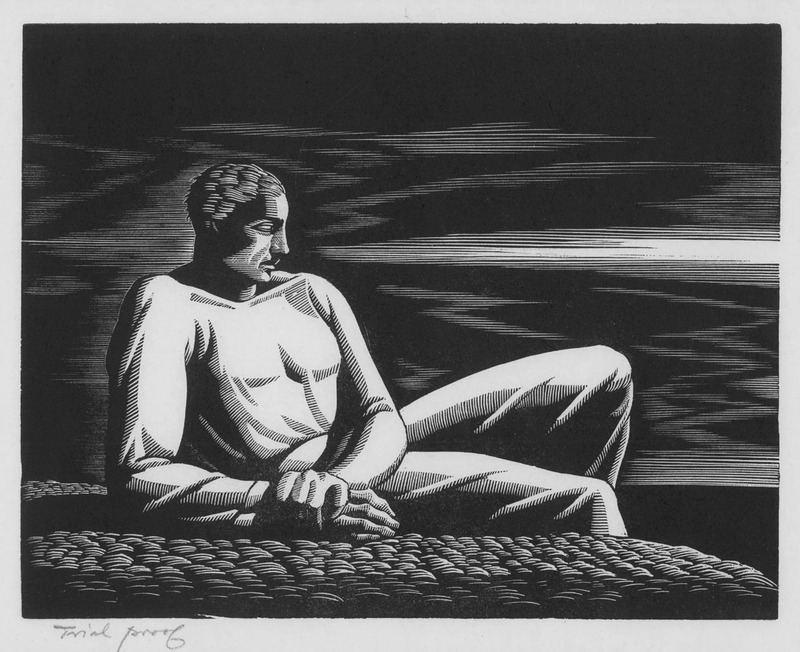 The muscular yet poised figure in a moment of nighttime contemplation invites the viewer to wonder what he is thinking about. This is a fantastic scene of the railroad tracks and surrounding industrial buildings in Oberhausen, Germany by American artist Joseph Pennell. 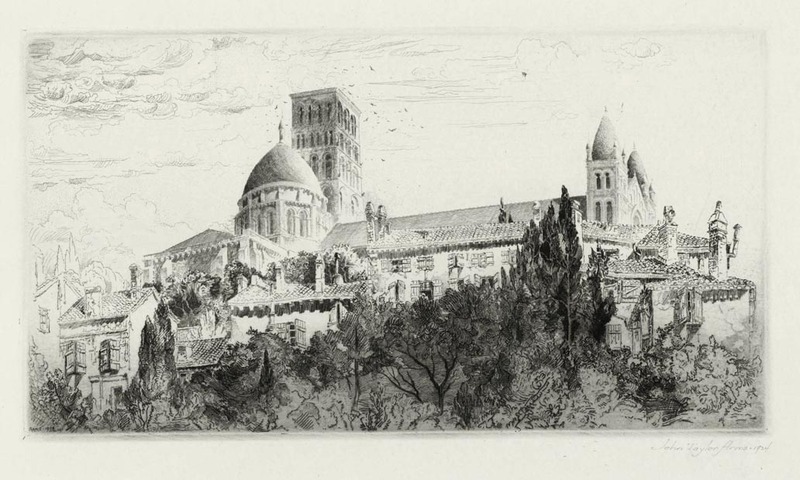 Etching, image size 9 3/8 x 12 1/2 inches, published in 1910 in an edition of 50 impressions, cat: Wuerth- 606, pencil signed "J. Pennell imp", the 'imp' indicating that Pennell printed this impression himself. 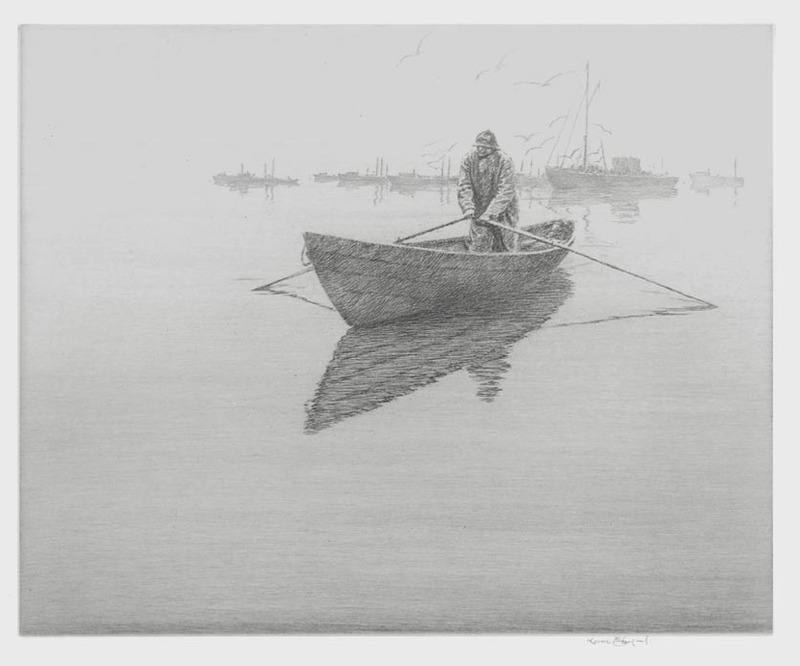 This etching is printed on an early antique watermarked laid type paper with trimmed margins and a tab signature, in the style of Whistler. There are two small rust spots which appear to be in the paper, as is common in early paper of this type. 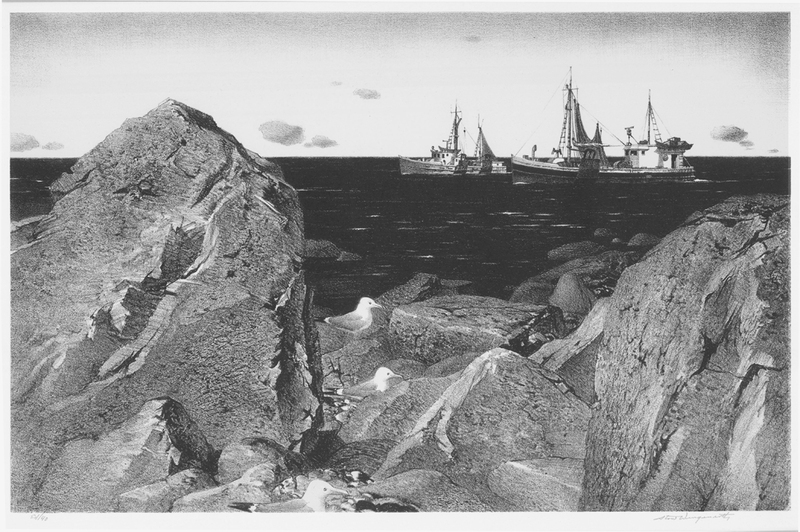 Pennell was one of the foremost American printmakers of the early 20th century, and was close friends with James McNeill Whistler, whose influence is evident in many of Pennell's images as well as his sense of experimentation with etching technique. 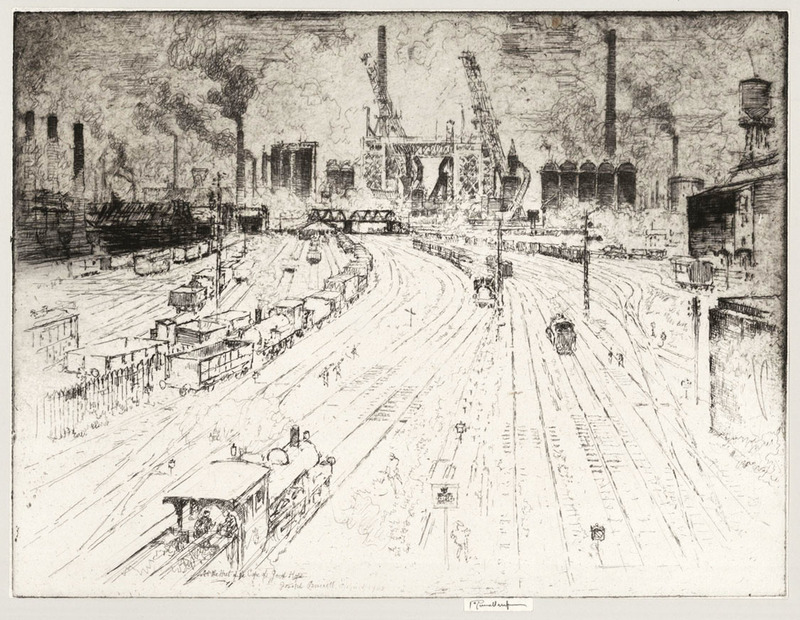 Pennell was especially known for his images of cityscapes and architecture; in this image the trains and surrounding factories provide the structure of the composition, while ghostly, quickly rendered figures give a human presence and sense of scale to the bustling railyard. Pencil signed, printed in 1923. 6 x 8 inches on 9 3/4 x 12 3/4 laid-type paper. Kuhler was one of the best known industrial designers of the American railroads. He learned etching after World War I and enrolled at the Academy of Art in Düsseldorf.